A study of people who thrive on the fringes of acceptable social behaviour, Eccentrics provides some interesting tidbits but is otherwise short on meaningful content and long on tiresome examples. Scotland-based neuropsychologist Dr. David Weeks oversaw the first known large-scale study of eccentrics in history. With no medical definition for the condition, the research consisted of asking for people who thought of themselves as eccentrics to step forward and be subjected to extensive interviews. From the results, Weeks and his team compiled common characteristics and behaviours that unify the trait. At the same time, eccentrics throughout history were studied based on their writings or the writings of their contemporaries. The results are summarized in the book, and vary from the obvious to the mildly interesting. 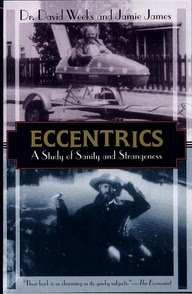 Eccentrics turn out to be generally happy, creative, curious, intelligent and non-conforming. How surprising these results are may define the level of enjoyment to be found reading the book, which, for the most part, gets busy stating the rather obvious. Too many pages are occupied with describing the eccentric behaviour of too many eccentrics past and present, a case of strange actions becoming irritating when overexposed, never more so than when the eccentrics' own pompous, non-linear or fragmented words are used -- there are good reasons most eccentrics are best avoided. Whether some individuals are eccentric, mentally sick, just plain weird, or seeking attention is open to debate, but in any event Weeks does not probe the reasons why we may care. There are chapters in Eccentrics dedicated to women (under-represented in historical terms); sexuality (understandably, eccentrics tend to be loners, limiting the scope of this particular chapter) and health (eccentrics are happy because they have generally shed societal pressures to conform). At the end of the book, the value that it offers remains narrow. Eccentrics may have worked better as a 15 page magazine article. As a book, it struggles for material and relevance. Subtitled "A Study Of Sanity And Strangeness". 255 pages, plus Bibliography and Index. Published in hardcover by Villard Books.